The strength of our economic future is dependent on the well-being of our nation’s children. Yet child poverty remains high in the United States, with 12.8 million (17.5 percent) of children living below the poverty line in 2017. Children continue to disproportionately experience poverty in the U.S. and are 62 percent more likely to experience poverty than adults. Due to unique structural and cultural barriers to economic security, children in immigrant families are more likely to be living in low-income households than children in U.S.-born families. These barriers include already narrow eligibility rules that prevent immigrant families from accessing critical assistance programs. 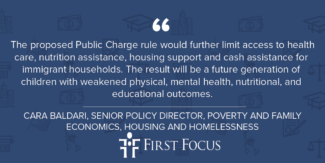 The proposed public charge rule released by the U.S. Department of Homeland Security on October 10th would only serve to further increase poverty among children in immigrant households, many of whom are U.S. citizens. The proposed rule would allow government officials to now consider the use of an applicant’s broad range of services such as Medicaid, the Supplemental Nutrition Assistance Program (SNAP), and housing assistance when determining eligibility for green cards and/or lawful admission to the U.S. The proposed rule would also continue the existing consideration of cash assistance through the Temporary Assistance for Needy Families (TANF) program and the Supplemental Security Income (SSI) program. The majority of children of immigrants live in a household where both parents are working and employed in essential, but lower-paying jobs that don’t provide access to employer-sponsored health insurance or a pension plan—diminishing these parents’ ability to invest in their children. Combined with skyrocketing rents and the high cost of everyday goods means, this means that immigrant parents still struggle to make ends meet and must turn to key assistance programs to supplement resources for their families. The proposed rule would further limit access to healthcare, nutrition assistance, housing support and cash assistance for immigrant households. The result will be a future generation of children with weakened physical, mental health, nutritional, and educational outcomes. This is not only cruel, but economically foolish. Child poverty already costs the U.S. over $1 trillion a year, representing 5.4 percent of our GDP. Stunningly, the Department of Homeland Security fails to account for the cost of increasing child poverty in its proposed rule’s cost benefit analysis. Indeed, though the agency acknowledges that the rule will result in “increased rates of poverty” among other harm, it treats this as a “non-monetized cost.” This assertion is misleading and vastly underestimates the economic damage this rule will impose on the nation. We know what works to reduce child poverty. Programs such as SNAP and TANF lift millions of children out of poverty each year. When these resources are provided at an early age, they create a long-term positive impact on the child’s life and long-term economic contributions. Everyone– regardless of socioeconomic status– benefits from strategies that reduce child poverty. First Focus strongly opposes this rule and its harmful repercussions on children and the country as a whole. We urge individuals and organizations to comment in opposition by the deadline of December 10th, 2018.